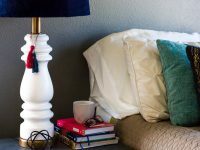 Like so many of us who love decorating, I’ve developed an admiration for everything Joanna Gaines decorates. That Fixer Upper style is just swoon-worthy, isn’t it? 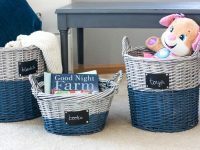 Although my personal decorating style isn’t farmhouse, I have still been finding myself trying to incorporate some farmhouse touches into our home. 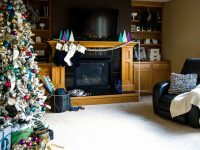 I especially love Joanna’s use of whites, wreaths and greenery in all of the rooms she decorates. So when I was challenged to make over a thrift store wreath for the Thrift Store Swap, I decided to transform it into a magnolia wreath, one of Joanna’s go-to accessories. 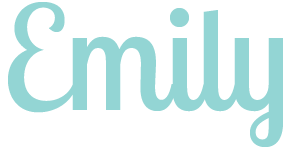 If you are unfamiliar with the Thrift Store Swap, organized by Lyn at MidMichiganMom, here are the basics. Fourteen crafty bloggers commit to buying and repurposing two thrift store items. 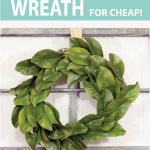 This time around, we all hunted down one thrifty wreath plus one item of our choice. Our budget was limited to $10 or less. Then, we shipped our thrifty finds to one of the other bloggers in the group and another gal shipped us two thrifted items. The swap turns into one big circle! Today, my thrift loving friends and I are all sharing our thrifty wreath transformations. And then we will be back next week to show off the second item we were challenged to revamp. 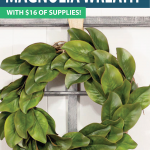 This DIY magnolia wreath was super simple to create, so let me share a quick tutorial with you and then I’ll leave links to all of my friends’ thrifty wreath makeovers at the end of this post. Sound good? This post contains affiliate links for your convenience. Please see my disclosure for details. 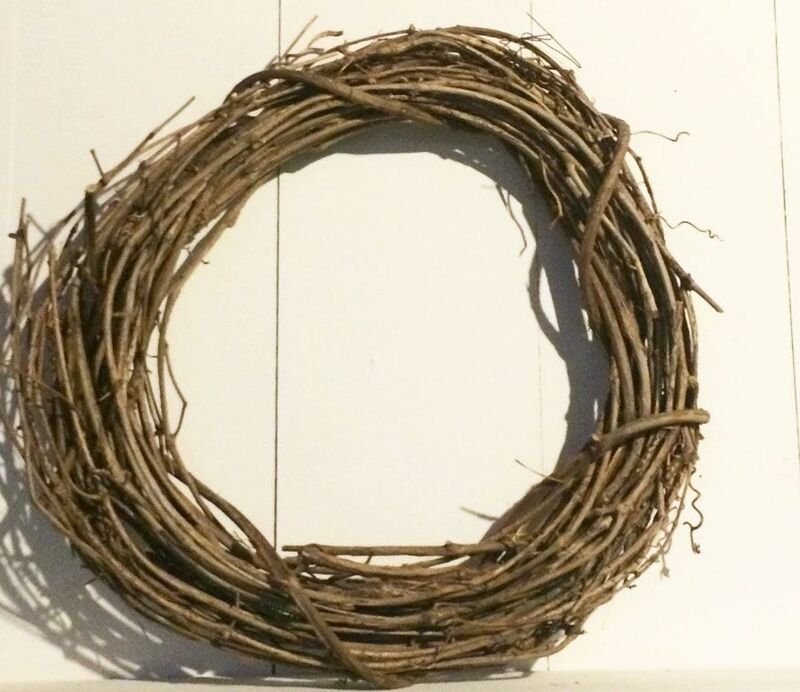 I started with this grapevine wreath that was found on the shelves of a thrift store. It was the perfect base for DIYing my magnolia wreath. I see these wreaths at thrift stores fairly often, so look out for one the next time you are out thrifting. 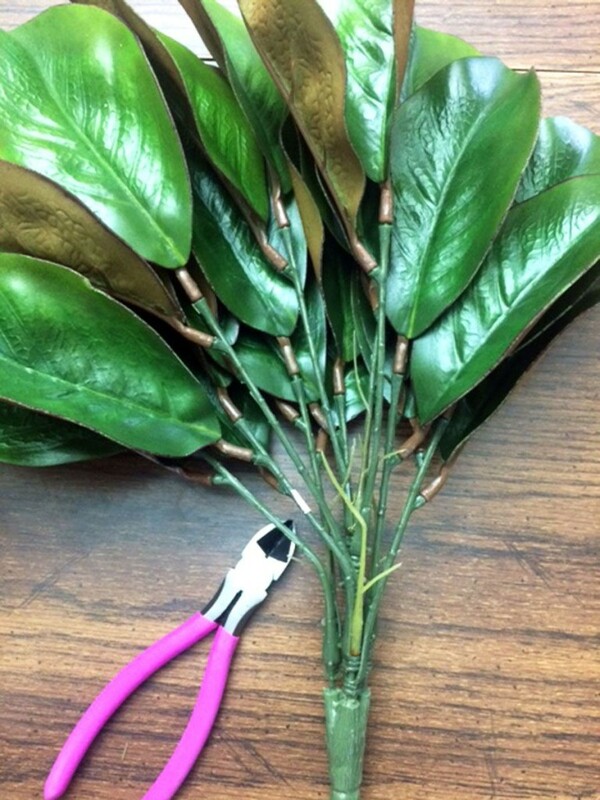 I picked up two bunches of artificial magnolia leaves from the craft store. I majorly scored because they were 50% off when I was there, making it $14 total for two bunches. That plus the $2 thrift store wreath makes this project come in at just $16! 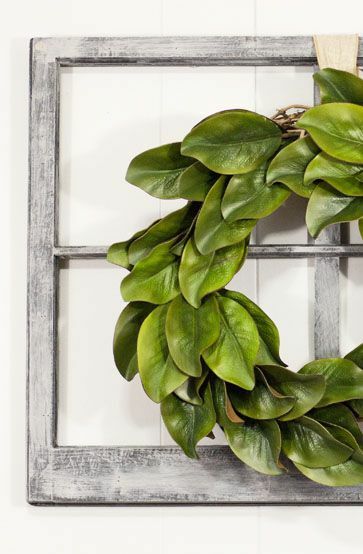 I love a good thrift store makeover, and this magnolia wreath definitely fits this bill! 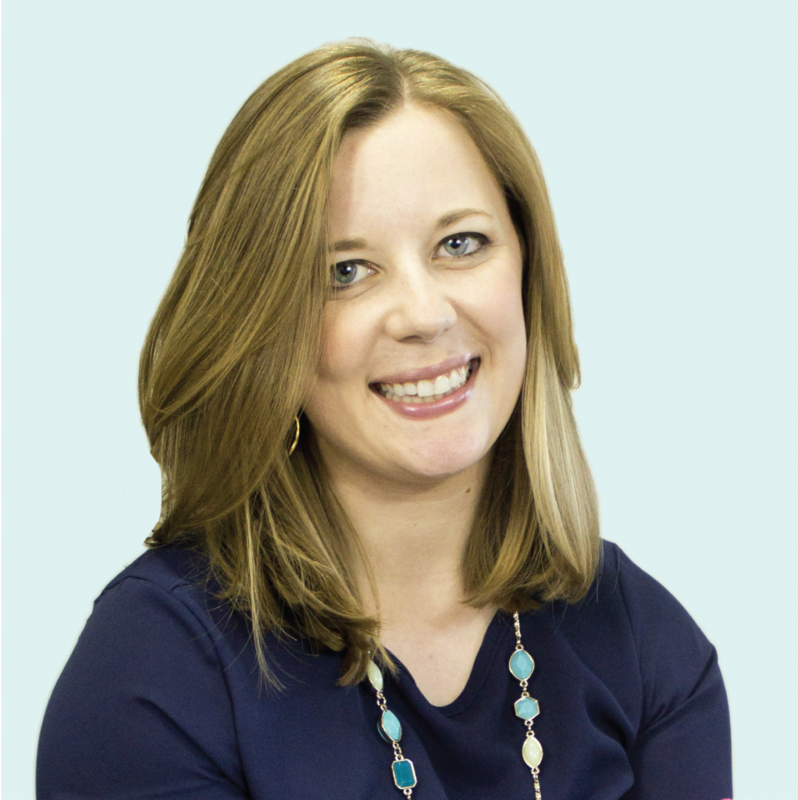 Plus, it’s super quick to create and can be completely done in under 30 minutes. Using a wire cutter, I snipped leaves off of the big bundle. There were three leaves on one stem, so I left them in stems of threes. Once I had the leaves cut, it was just a matter of tucking them into the grapevine wreath base. I worked my way around the wreath, layering manolia leaves on top of each other as I went. I ended up using the full two bunches to create a full looking wreath. The leaf stems were long enough to tuck into the wreath base well enough to keep them secure, which was awesome because I didn’t need to fuss over using floral wire or anything like that. All I did was tuck them in well and I was set! Once the leaves were all in place, I looped burlap ribbon through the wreath and tied it on the top of an old thrifted window frame I’ve been wanting to hang up forever. The window frame was originally painted a solid black, which seemed too harsh on my light grey walls. So I took a cue from Fixer Upper and gave it a whitewashed look by dry brushing a generous coat of light grey paint over top. 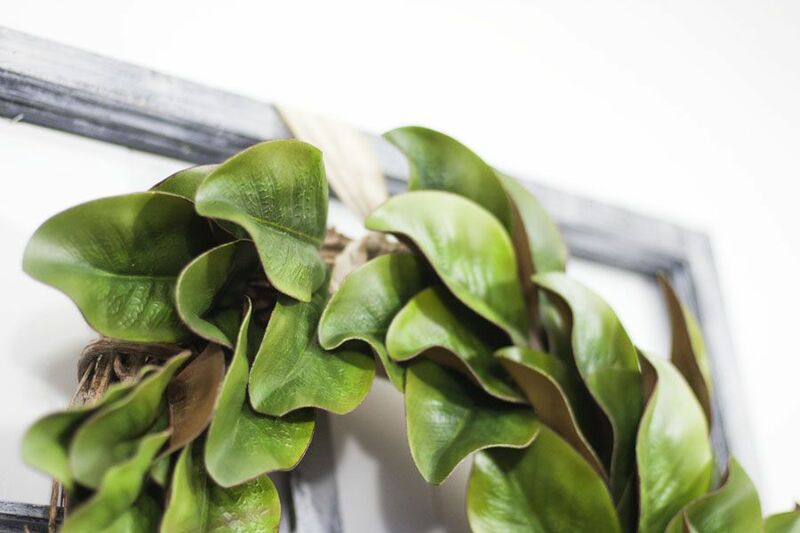 I am in love with the contrast of the rustic window with the bright green magnolia leaves. This wreath turned out so pretty that I just know I’ll be moving it all over our house over time. My favorite decorations always get moved a lot! 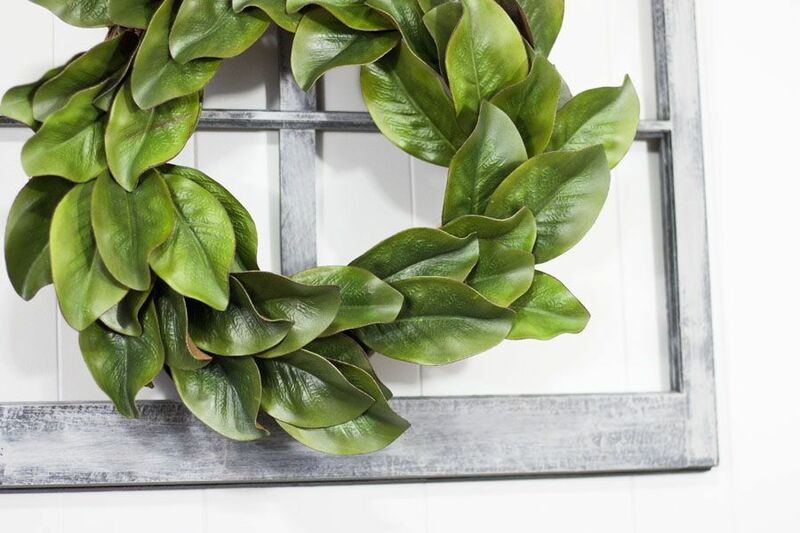 Are you loving the Fixer Upper inspired magnolia wreath look? I can’t believe how easy and cheap this was to DIY! 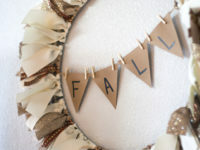 For even more thrifty wreath inspiration, go check out what my fellow Thrift Store Swap pals have been DIYing. Wreaths are a staple item at most thrift stores, so pick one up the next time you are out thrifting and repurpose it into something beautiful for your home! 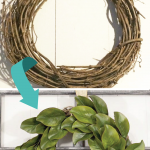 Here are the geniuses behind these thrift wreath tutorials. Make sure to check out each one! Love this post! Good looking fake greenery is hard to find! Do you mind sharing which craft store? The leaves are a nice shade of green. Often, I find faux-magnolia leaves are too dark, but love these! Thanks for sharing! Hi Claire! 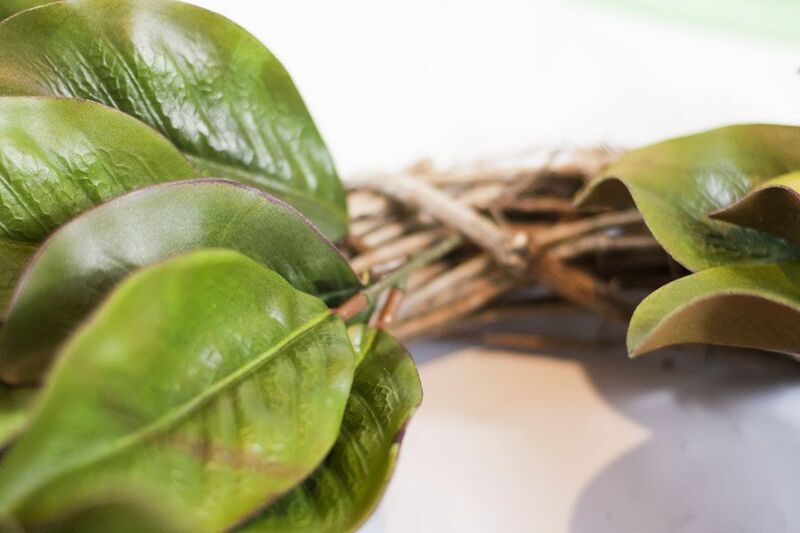 You’re so right, real looking fake greenery can be hard to find. These were from Hobby Lobby. I almost just bought the wreath for Magnolia Market’s website. I’m so glad I decided to do a quick search on Pinterest first! I will definitely be using your tutorial to save a LOT of money making my own. Thank you!! Hey Heather, so glad you found this tutorial! It was really easy to create and MUCH cheaper than ordering one pre-made. I hope yours turns out amazing! Love it, Emily! Such a classy update!!! Adorable! I bet it looks fab in your dining room! Emily! This looks amazing! 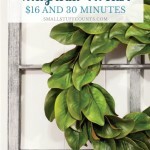 I love the effortless way you connected to JoJo’s farmhouse style… your wreath is absolutely gorgeous! I am a big Joanna Gaines fan myself. You totally nailed her style. Your wreath is so classy and beautiful. 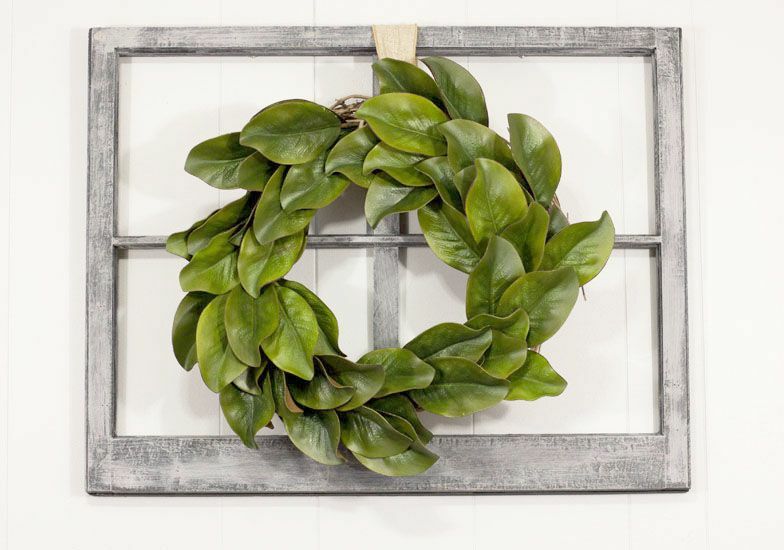 It goes perfectly with your gray window frame. Well done! Love these types of magnolia wreaths. So versatile and something that can be used anywhere. This decor is so clean and versatile. My decorating style is not farm house either but I adore the look. Now I’m trying to figure out where I could hang a wreath like this in my home! 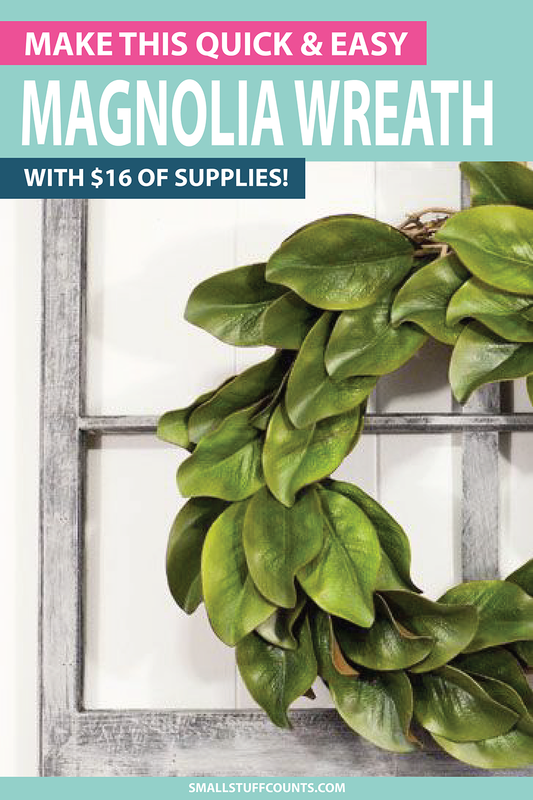 Thank you for showing us how easy and inexpensive a DIY Magnolia Wreath can be. I’m officially hooked. Very pretty! I love the simple leaves and they look real too!